As the PCT runs from Mexico to Canada, it goes near and through many towns along the way. These towns are called Trail Towns, and they are very much a part of the trail experience. Places like Hiker Heaven in Agua Dulce, CA or the final and most remote trail town, Stehekin, WA are on the “must do” list along the trail. As I hike, I will be carrying corresponding sections from Yogi’s Trail Town Guide. This informative guide is often more cherished by hikers than the actual trail maps of the PCT. The guide includes information on how far each town is from the trail, who you can call if you need a ride, where the hiker hot spots are, and where to find hotels, internet, post offices, laundromats, grocery stores, gear stores, etc. These trail towns are often a source of motivation for hikers. It’s amazing how fast you can hike when you know you’re headed to a town with an all you can eat buffet! 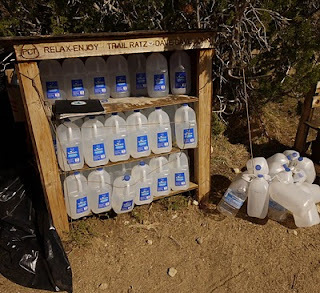 A water cache in So California supplied by trail angels. Trail Angels are people (some anonymous) who watch over hikers like guardian angels and provide help along the trail. In the desert, trail angels keep water caches stocked with jugs of water for hikers where there are insanely long distances between water sources. Others have been know to leave coolers along difficult stretches that contain goodies like soda, beer, fruit, and ice cream bars. I’ve heard stories from hikers about times when a hiker coming from the other direction tells them about treats left by a trail angel miles up the trail, and how they sprint to get to that cooler before the goodies run out. There are also trail angels who set up a grill and cook out for passing hikers over the weekend. Trail angels don’t just supply food. They also offer services like shuttles into town, or even places to stay for a night and to get a hot shower and do laundry. Again, it’s amazing how giving and supportive complete strangers can be along the trail. Sometimes things just happen along the trail when you least expect it, and it turns out to be at just the right moment. This is called Trail Magic, and when it happens, it’s amazing! Recently, I was doing a 14 mile training hike in Forest Park with fellow PCTers, Matthew and Samantha. It was raining and cold, and we had just finished an extended uphill section when I decided to reward myself with lunch. That’s when Matthew and Samantha noticed that neither one of them remembered to grab their lunch off the counter. As we proceeded to split my lunch in three, two women came running up the hill. I commented to them about the hill and our snack reward. They said that they were in the process of doing a half marathon that they had organized for fun with their friends, and that their support table was right around the corner. They told us to come on over and join them. We turned the corner to find a heavenly selection of pb&j triangles, Girl Scout Cookies, pretzels, Sour Patch Kids, homemade cookies, soda, and more! That experience made that long, cold, rainy hike one of my recent favorites. Now that’s trail magic! Nice! Trail Angels…Trail Magic…Moms like this!